The joy of walking the streets of the Old City during the nights is breathtaking. The stores and the stalls are all festive and lit up, and we cannot tell you how amazing the aroma of kebabs and street food is! We gulped down some avocado juice from Milan Juice Centre and braced ourselves to grab all the affordable beauties from Laad Bazaar. So, let’s get to shopping, shall we? Strolling through Laad Bazaar, we found plenty of desi crop jackets with embroidery and mirror work. These come in different colours and are perfect for your kurta and patiala. At INR 200 each, we had to get them. 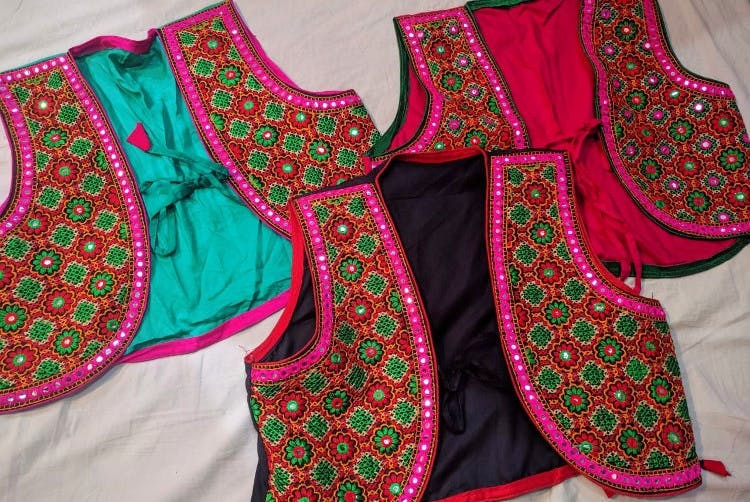 The wholesale stores lined along the market have stocked up on fancy fabrics, ikat, kalamkari, brocades, Benaras silk, chiffon, and so much more. We showered some love on Kalamkari cloth pieces and at INR 80 per metre upwards, we got ourselves some. While the price range of Benaras silk is around INR 350-850 (depending on your choice), they are quite good for weddings and festive collections. Now this is something that got us super excited. Although we frequent Old City for our supply of kitschy jewellery, we’ve never found these multi-coloured earrings before. Pair them with plain kurtas or you’re all set to add a festive look to your outfit. Plus, don’t they just remind you of Gems? Be sure to bargain hard if they quote a higher price. The streets are flooding with potlis of different sizes, shapes, and colours, and we checked out some. Done in different fabrics and embroidery, these can make you stand out in the crowd. Pair them with an ethnic dress or grab them for gifting someone. We’re doing both. We found several desi sling bags with tassles at a wholesale store and we’re loving them. While the store owner declared that the store has new arrivals once in a month, he had enough goodness to keep us going back. Ooh, the variety of bangles. Right from metallic ones to glass and fancy bangles, the stores and street vendors have lovely collection for you to go nuts about. The collection also includes some grand ones with elaborate work.